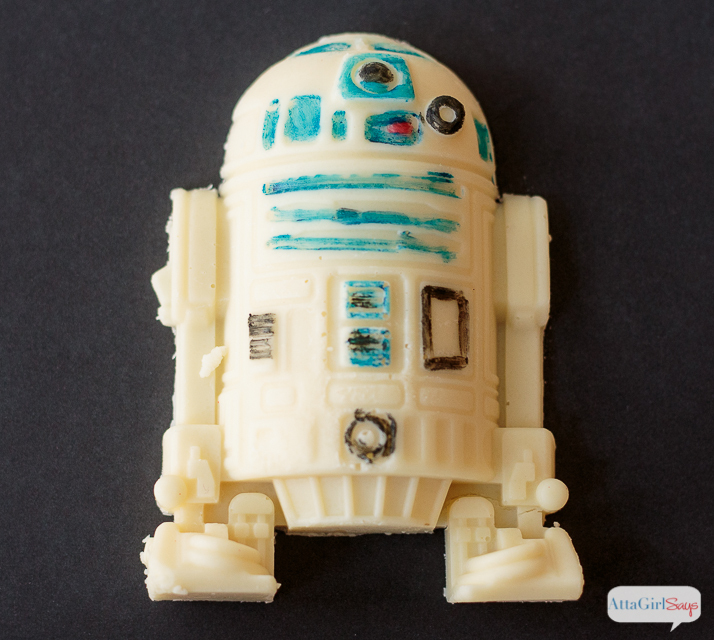 So, I had to squeeze in one last Star Wars project; homemade R2-D2 and Han Solo chocolate candies. They’re really easy to make, but man are they cool. 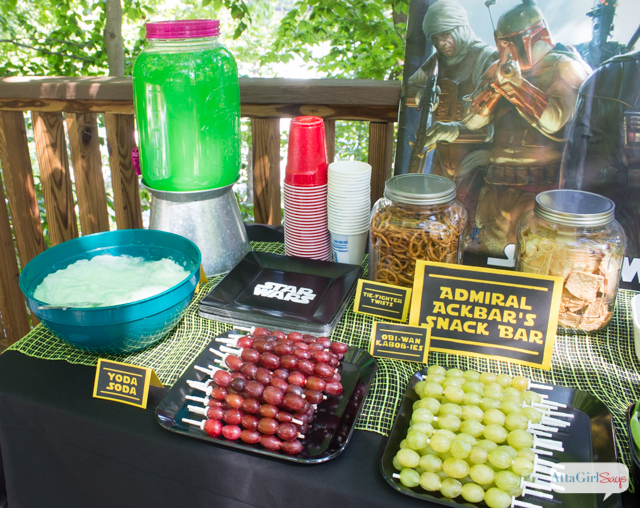 Of all the Star Wars food we served, these were the most popular treat at my son’s epic Star Wars birthday party. 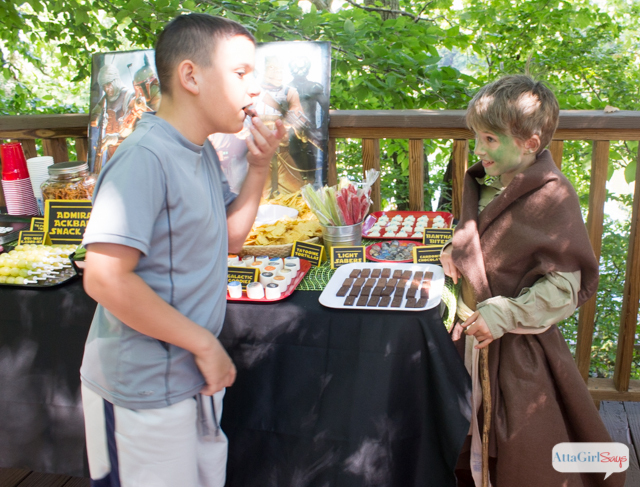 I think one kid ate a dozen R2-D2s! This post contains affiliate links. If you purchase an item based on my referral, I will earn a small commission at no additional cost to you. I only recommend products I use and love. Read my full disclosure policy here. Now, let me show you how it’s done. We’ll star with Han Solo because he’s easier. Be sure to follow the package directions when you’re melting chocolate or candy wafers. Different brands will have different recommendations for melting. You can either do melt them in the microwave or over a double boiler. Just figure out the method that works best for you and stick with it. 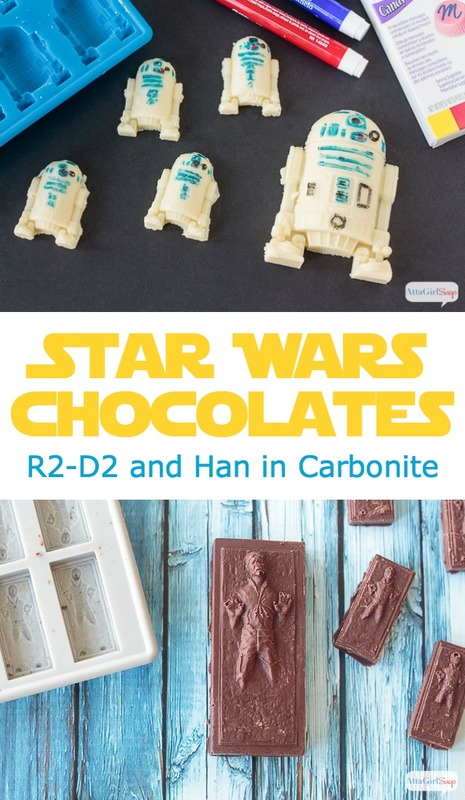 Now, let me show you how to make the R2-D2 candies. 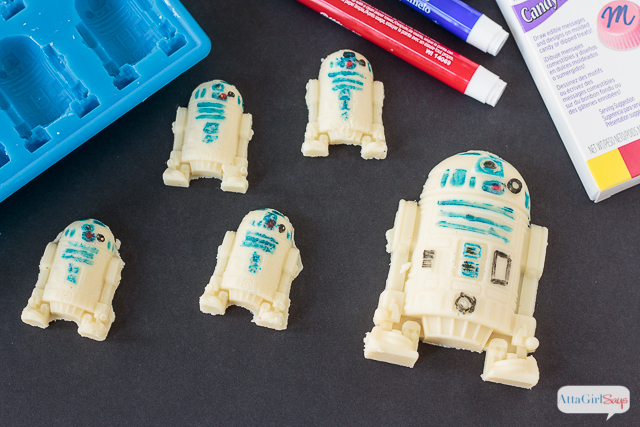 These are a bit more complicated because the mold is more detailed, and you’ll also want to color some of the droid’s features with the candy decorating markers. Aren’t these just the cutest? And the yummiest? 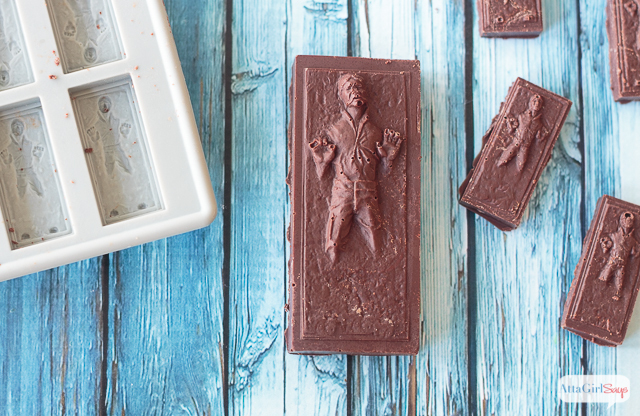 You can get these silicon molds for other Star Wars characters and vehicles, including Darth Vader, Boba Fett, stormtroopers, the Millennium Falcon, the Death Star and the X-Wing Fighter. I wouldn’t be surprised to see our favorite droid BB-8 join the lineup. You can see all my Star Wars ideas here. 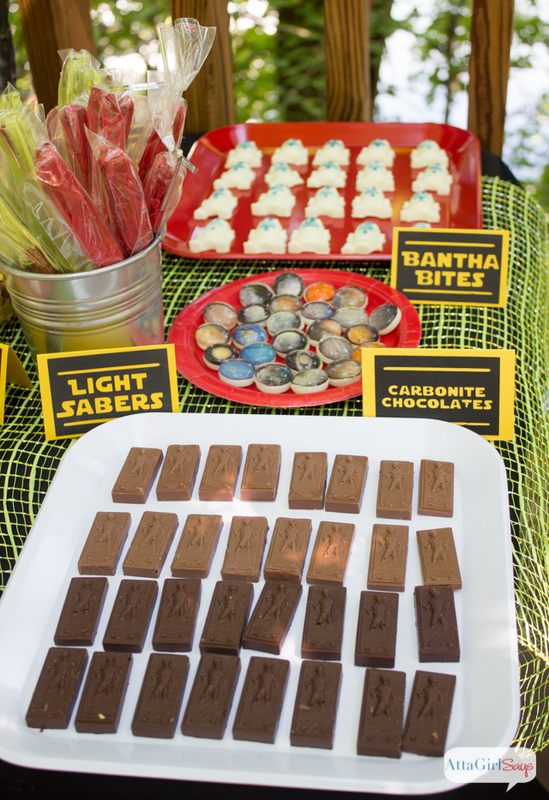 How fun is this party idea! Pinned & shared. Love the chocolates too. Thanks for sharing at the Inspiration Spotlight party. Hope you had a Merry Christmas! Happy New Year, almost. I love these! 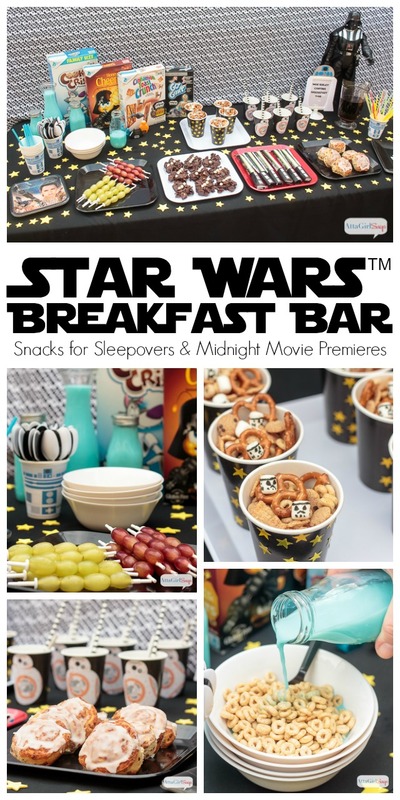 My husband and toddler are so obsessed with star wars, I just know we will have a million parties and Star Wars themed events in the next decade or two. This is great to add to my list of things to include when I do have said arty. I think I already have the molds and everything too. At least the Hans in Carbonite one. You should come link up at our Bloggers Spotlight party, we pin everything to our group board and have two separate link-ups, one for posts and one devoted to pins so you get even more exposure!